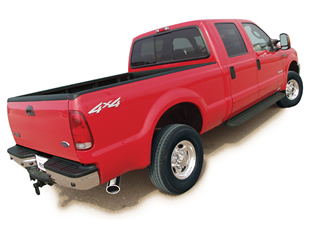 The BORLA Cat-Back exhaust system feature a patented straight-through muffler for ideal air flow to unleash the hidden horsepower in your truck. The increased exhaust velocity of the cat-back exhaust adds power, driving excitement, fuel economy and the distinctive sound of power recognized by motor enthusiasts everywhere. Each system is built from premium Aircraft-Quality Stainless Steel, for durability and to give you the absolute best in performance. The system is produced with smooth mandrel bends, meaning it has no crimps in the bends to ensure maximum flow and power. For the performance, sound, and looks to enhance your truck, the Borla Performance Cat-Back Exhaust System will exceed all your expectations. BORLA stands behind every system with a Million-Mile Warranty.